When we were parked under the shadow of Ben More we got talking to the occupants of one of the campervans and they recommended Fidden Farm campsite. They waxed lyrical about the beauty of the location and strongly recommended that we visit. So when Paul woke up the following morning with achy legs and a desire to chill out we decided we might as well give it a go. 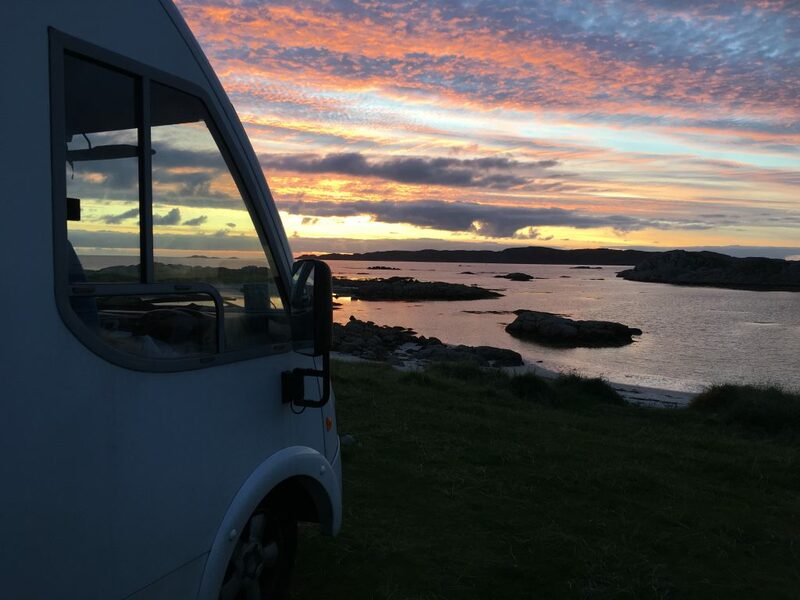 Fidden Farm is located at the end of the Ross of Mull – the southernmost peninsular of Mull that terminates at Fionnport, the staging point for the island of Iona. It was quite a drive to get there, the road that runs under the steep cliffs of Creag Mhor is spectacular, from a distance it looks precarious with one point where cars seem to be driving across a deep chasm, but when you are on it it’s well constructed with good passing places so we could relax(ish) and enjoy the view. Yet again we had planned a leisurely trip with some stops along the way and yet again we were mostly thwarted by a lack of parking. The scenery was beautiful but we didn’t have much chance to view it up close. We stopped at Pennyghael and Bunessan for a bit of grocery shopping which gave us a chance to get out and stretch our legs. Paul’s legs were still achy but unusually I didn’t have any tight muscles; maybe all this exercise is having a positive effect. We finally made it to Fidden Farm. The campsite is relatively basic – no hardstanding or electricity, but there is a new toilet and shower block by the farmhouse as well as portaloos in the camping area. Pitches are not marked, but there is a huge expanse of grass and dunes dotted with outcrops of the pink granite that mark this area. 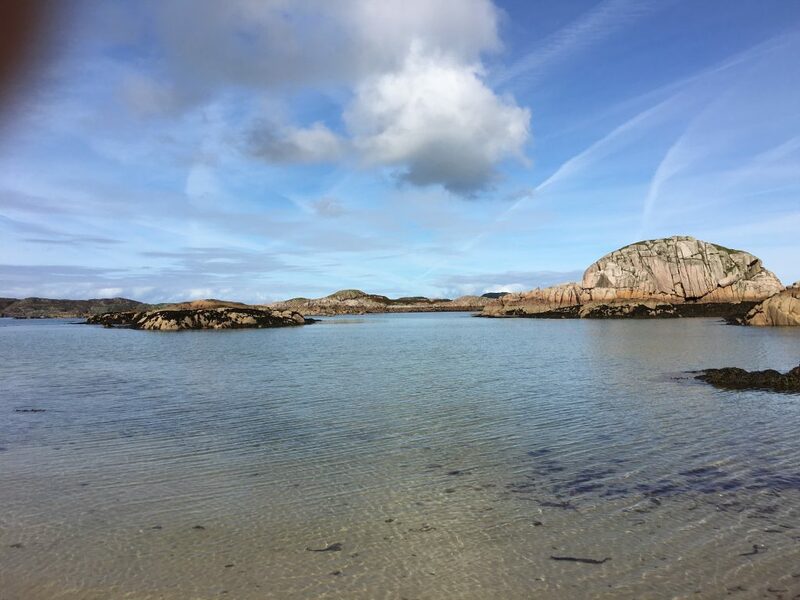 There were plenty of places to park with a view across the bay of beautiful white sand beaches and pink granite islets. It really was as beautiful as we had been told, and the sun was still shining which made it even more special. We didn’t do much else all day apart from wander around the beaches and rocks, paddle in the sea and sit in Bertie watching the tide come in and the sun set. At £8 per adult the campsite was reasonable value. There were notices in the toilets warning of a price increase in 2018 to £10 per adult. Without electricity this starts to feel a bit steep, especially for families who would then have to pay £5 per child on top and jostle for prime beachfront locations in high season. Will they price themselves out of the market or does the location make the price worthwhile? As a couple we’d be happy to go back, if we were going as a family I would be considering elsewhere.